For Reilly Walsh, playing hockey was inevitable. Walsh grew up on the campus at Proctor Academy in Andover, NH, where his father, Mike is the head coach. He expressed his gratitude for his father’s support as well as the opportunity to play on the pond there. Mike pushed Reilly to always set the best possible example for his younger brother Ronan, and Reilly believes it has helped him to become a leader on the ice. Walsh knew relatively early in his high school career that he wanted to head to Cambridge to play at Harvard for a multitude of reasons. Walsh joined fellow Proctor alum, Merrick Madsen at Harvard and he says their friendship has carried over to playing in Cambridge. 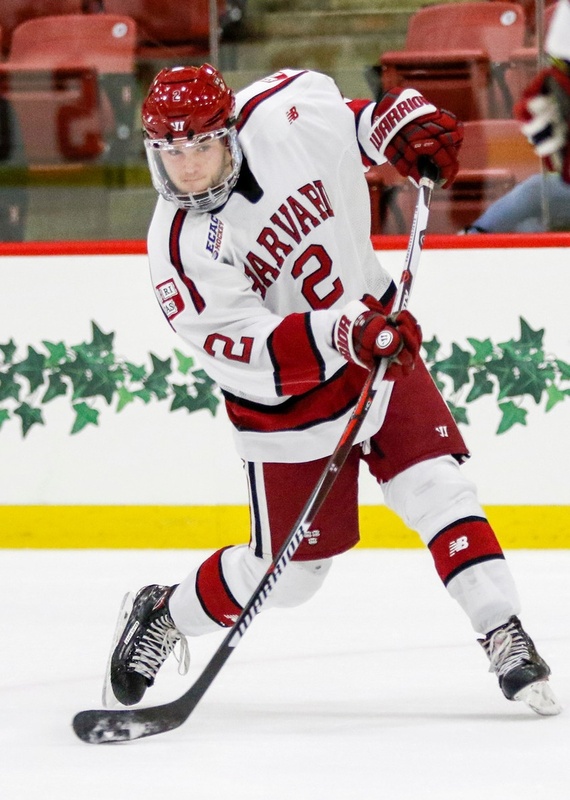 A top line defensemen this year for the Crimson as a freshman, Walsh said he has enjoyed his time there thus far. Walsh did say that he looks to the captains for guidance at times. Drafted by the NJ Devils with the No. 81 overall pick in this past year’s NHL Draft, Walsh said the experience of being selected is something he won’t forget. Walsh made the preliminary roster for the Team USA World Juniors U20 tournament in Buffalo, but just missed out on the final cuts. While he expressed disappointment, Walsh said that he is moving forward and using it as motivation. Still, the opportunity to play alongside players like Brady Tkachuk, Kieffer Bellows and Casey Mittelstadt was not something that Walsh takes lightly. Now a part of a team that went 26-8-2 last year before losing to Minnesota Duluth in the Frozen Four in Chicago, Walsh recognizes that there’s a certain expectation for excellence at Harvard, but that a majority of the pressure comes from the players themselves. When asked whether he feels pressure about being one of the best players in college hockey as a freshman, Walsh said he doesn’t feel any pressure from the outside world. Walsh currently has 3 goals and 9 assists with a +2 rating for the Crimson through 21 games.